Netaji’s escape route took him via modern day Pakistan, Afghanistan and Soviet Russia. Supporters of the Aga Khan III helped him across the border into Afghanistan. After assuming the guise of a Pashtun insurance agent to reach Afghanistan, Bose changed his guise and traveled to Moscow on the Italian passport of an Italian nobleman. From Moscow, he reached Rome, and from there he traveled to Germany. In Germany, he instituted the Special Bureau for India under Adam von Trott zu Solz, broadcasting on the German-sponsored Azad Hind Radio. He founded the Free India Center in Berlin, and created the Indian Legion consisting of some 4500 soldiers out of Indian prisoners of war who had previously fought for the British in North Africa. A left-wing admirer of Russia, he was devastated when Hitler's tanks rolled across the Soviet border. Matters were worsened by the fact that the now-retreating German army would be in no position to offer him help in driving the British from India. When he met Hitler in May 1942 his suspicions were confirmed, and he came to believe that the Nazi leader was more interested in using his men to win propaganda victories than military ones. So, in February 1943, Bose turned his back on his legionnaires and slipped secretly away aboard a submarine bound for Japan. This left the men he had recruited leaderless in Germany. Bose spent almost three years in Berlin, Germany from 1941 until 1943, during which he married Emilie Schenkl and a daughter Anita Bose Pfaff was born to them in 1942. During this time, the Indian National Army (INA) or the Azad Hind Fauj was born. Originally, it was founded by Capt Mohan Singh in Singapore in September 1942 with Japan's Indian POWs in the Far East. This was with the support of the Indian Independence League, headed by expatriate nationalist leader Rash Behari Bose. However, the first INA was disbanded almost immediately in December 1942 after disagreements between Hikari Kikan and Mohan Singh, who came to believe that the Japanese High Command was using the INA as a mere pawn and propaganda tool. Mohan Singh was taken into custody and the troops returned to the prisoner-of-war camp. However, the idea of a liberation army was revived with the arrival of Subhas Chandra Bose in the Far East in 1943. In July, at a meeting in Singapore, Rash Behari Bose handed over control of the organization to Subhas Chandra Bose. Bose was able to reorganize the fledgling army and gained massive support among the expatriate Indian population in south-east Asia. They supported by both enlisting in the Indian National Army, as well as financially. At its height it, INA consisted of about 85,000 troops, including a separate women's unit, the Rani of Jhansi Regiment, headed by Capt. Lakshmi Swaminathan. This second INA fought along with the Imperial Japanese Army against the British and Commonwealth forces in the campaigns in Burma, Imphal and Kohima, and later, against the successful Burma Campaign of the Allies. When Japanese funding for the army diminished, Bose was forced to raise taxes on the Indian populations of Malaysia and Singapore who supported INA. When the Japanese were defeated at the battles of Kohima and Imphal, the INA was forced to pull back, along with the retreating Japanese army. Finally, with the fall of Rangoon, the INA troops surrendered under Lt Col Loganathan. The remaining troops retreated with Bose towards Malaya or escaped to Thailand. Japan's surrender at the end of the war also led to the eventual surrender of the Indian National Army, when the troops of the British Indian Army were repatriated to India and some tried for treason. Bose is alleged to have died in a plane crash in Taihoku (Taipei), Taiwan, on 18 August 1945 while en route to either Tokyo or possibly the then Soviet Union. The Imperial Japanese Army Air Force Bomber he was travelling on had engine trouble and when it crashed Bose was badly burned, dying in a local hospital four hours later. It is believed that his body was cremated, and a Buddhist memorial service was held at Nishi Honganji Temple in Taihoku. His ashes were taken to Japan and interred at the Renkōji Temple in Tokyo. However, the absence of his body has led to many theories suggesting his possible survival. One such claim is that Bose actually died later in Siberia, while in Soviet captivity. According the Inquiry Commission under Justice Mukherjee, which investigated the Bose disappearance mystery in the period 1999-2005, the Taiwan government confirmed that no plane carrying Bose had ever crashed in Taipei, and there was, in fact, no plane crash in Taiwan on 18 August 1945 as alleged. The Mukherjee Commission also received a report originating from the U.S. Department of State supporting the claim of the Taiwan Government that no such air crash took place during that time frame. Recently Netaji's grand nephew Sugata Bose in his book "His Majesty's Opponent" claimed that the founder of the Indian Independence League in Tokyo, Rama Murti had hidden a portion of alleged cremated remains of Bose as "extra precaution" in his house and secondly, this portion has been brought to India in 2006. 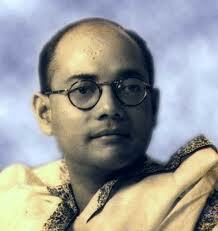 Bhagavad Gita was a great source of inspiration for Netaji in his struggle against the British. Swami Vivekananda's teachings on universalism, his nationalist thoughts and his emphasis on social service and reform had all inspired Subhas Chandra Bose from his very young days. The fresh interpretation of the India's ancient scriptures had appealed immensely to him. Many scholars believe that Hindu spirituality formed an essential part of his political and social thought through his adult life, although there was no sense of bigotry or orthodoxy in it. Subhas who called himself a socialist, believed that socialism in India owed its origins to Swami Vivekananda. Bose's correspondence prior to 1939 reflects his deep disapproval of the racist practices of, and annulment of democratic institutions in Nazi Germany However, he expressed admiration for the authoritarian methods (though not the racial ideologies) which he saw in Italy and Germany during the 1930s, and thought they could be used in building an independent India. While Bose had clearly expressed in his early days that democracy was the best option for India, his belief seems to have changed during the second World War. He seems to have decided that no democratic system could be adequate to overcome India's poverty and social inequalities, and that an authoritarian state, similar to that of former Soviet Russia would be needed for the process of national re-building.